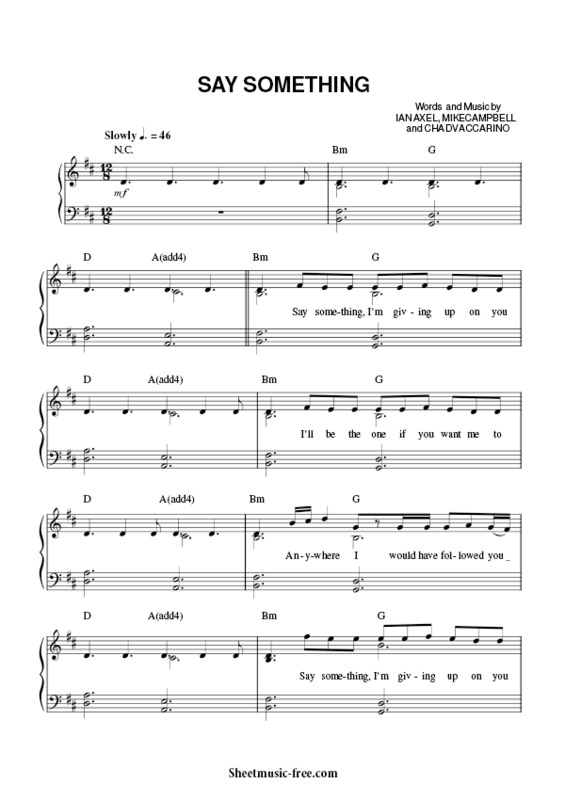 “Say Something Sheet Music” by Christina Aguilera ft A Great Big World, “ Say Something Sheet Music” for Piano / Vocal/ Chords / Guitar , Original key: D Major, number of pages sheet music PDF: 2, Video and Lyrics song Say Something Sheet Music. “Say Something Sheet Music” is a song by American indie pop duo A Great Big World from their debut album, Is There Anybody Out There? (2013). The track gained attention from singer Christina Aguilera, who wanted to collaborate with A Great Big World on the song. Quickly afterwards, a re-recorded version of “Say Something” with Aguilera was released on November 4, 2013. “Say Something” is a slow-tempo indie pop piano ballad which talks about a breakup, where the lover is implored to make a statement that could potentially reverse plans, with the singers expressing humility, sadness and regret. In the single version with Aguilera, she plays a ghost of the lover to whom the song is addressed as she traces the steps of the lead vocal. From the Album: Is There Anybody Out There? Say Something Sheet Music Christina Aguilera ft A Great Big World.